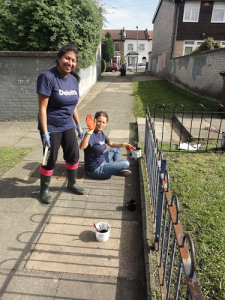 If your company would like to participate in a corporate volunteering event and get a team of volunteers together to support Brayard Estate in Peckham, we would like to hear from you. For a competitive fee we can create and run fun bespoke activities that shall be a great benefit to both your staff and local Southwark community projects run at Brayards Estate. Plus at the same time help improve the image of your organisation through working with us to implement this great corporate social responsibility (CSR) initiative. Habitat box creation, Mural creation, Planting flowers and bulbs in green spaces, Painting fencing and walls, Hedge planting, Tree planting, Path creation, Hedge pruning and weeding, Bird box making, Creating and maintaining organic food growing areas, and many more exciting activities. 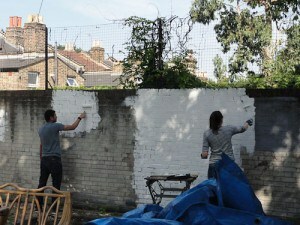 We may also be able to offer your team an inside volunteer activity such as painting a community hall. For team volunteering we provide first aid cover (trained first aider), risk assessments and liability insurance to cover for each individual volunteer team event. We provide all the tools and equipment for each task but we do ask companies / corporate volunteer teams taking part to donate some money to cover costs of materials and other expenses. We normally provide light refreshments such as tea/coffee and biscuits. 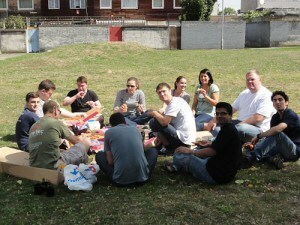 Plus we can provide lunch if the company can provide money to cover this expense, but in general most corporate volunteer teams prefer ordering their own food or going to local cafes / restaurants. 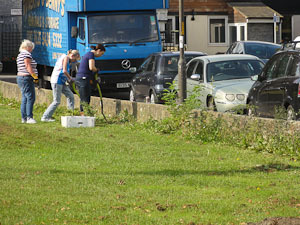 We can offer a limited number of individual corporate employee volunteering opportunities at our offices (admin, PR, accounting), plus opportunities on outdoor practical nature conservation projects, organic food growing projects, projects working with local children and many other employee volunteering possibilities. On these schemes we are keen to work with companies to offer their employees longer term opportunities, that will benefit Brayards Estate, local communities and provide the individual staff members with fantastic opportunities which provide relevant job experience training. BETRA would welcome the support from businesses in any form to help us deliver our aims and improve the lives of many local people. Businesses can support us in a range of different ways including donations and sponsorship, project partnership or supported delivery and volunteering. We believe that your business will gain great benefits from supporting our projects. BETRA works with local communities from some of the most deprived areas of South London providing local people with facilities for recreation & amenity in order to encourage community spirit. BETRA works with many partner organisations including other TRAs to achieve their aims, which include the promotion of harmonious functioning of this multiracial community & working toward the elimination of all forms of racism & discrimination within it. BETRA is working to achieve their aim through community projects and making improves to the Estate in order to create a safer environment for all tenants & residents. Through running community projects, workshops and events, BETRA is helping to improve the natural environment, building community spirit and teaching participants new skills.